Here at BlueStacks, we’re always working to bring innovations to our users and, above all else, to bring the best and most recent Android games to your PC. However, after porting the said games to our platform, we don’t like to rest on our laurels; we’re always researching, innovating, and developing tools so that not only can you get access to the best games, but also play them in the most comfortable and intuitive manner possible. Langrisser is a turn-based strategy game in which you must complete several battle scenarios by issuing commands to your faithful soldiers in order to move through the continent, defeat the forces of the devil tribe, and bring the light back to the world. If you haven’t done so already, we recommend reading our review on the game so you can learn why all the fuss about it. 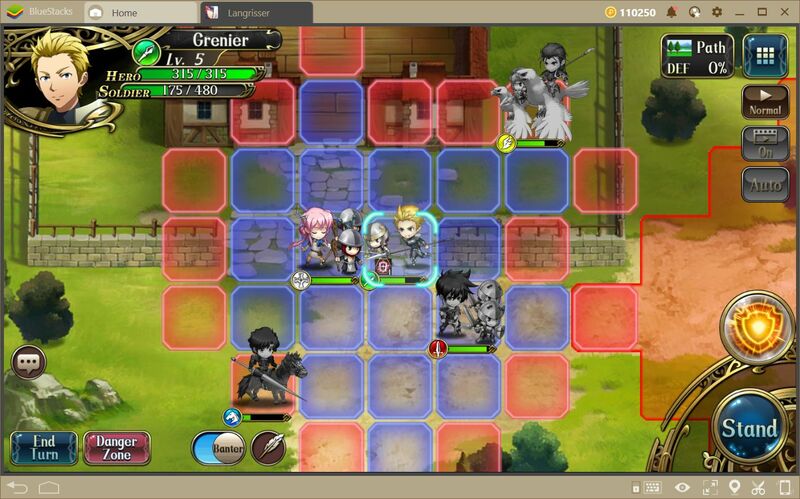 As we mentioned above, the combat in this game consists of phases in which each side takes turns moving their units across the map—which is a grid—and exchange attacks until there is only one team left. In this sense, the game resembles chess, but with the difference that, in every turn, each combatant can move all of his units before finalizing and passing to the next player. In terms of gameplay, and aside from the strategy elements that set this game apart from the others, its interface is very easy to navigate, especially if you’re playing with your mouse; it resembles a PC strategy game for the most part. However, this aspect of the game can be improved upon greatly with BlueStacks. 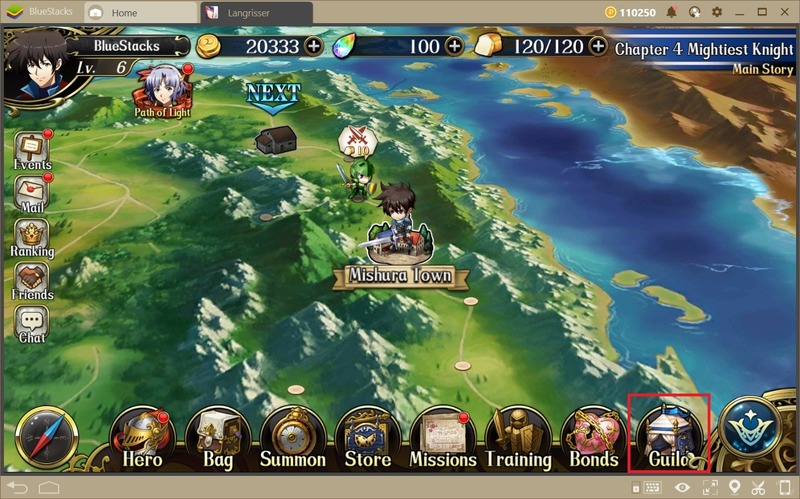 Below we will show you how you can use BlueStacks to your advantage and improve your performance in Langrisser. A considerable part of your success in any game, generally speaking, comes from your ability to control it. If these controls are poorly-designed—or are non-existent—, there would be no easy way to obtain victory. In these cases, you’d be fighting with the controls as much as you fight against your enemies in-game, and your combat prowess will suffer because of it. Mobile games, above all others, suffer from this weakness since their controls are designed for touchscreens, which frequently fail to tap* into the platform’s true potential. 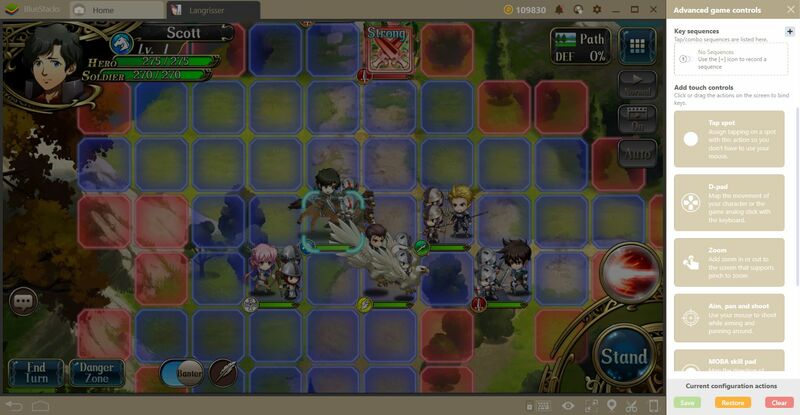 Luckily, BlueStacks allows you to create awesome control schemes to increase your success in Langrisser. In combat, specifically, a good control scheme will allow you to speed up your actions in each turn and to make precise decisions, while also forgoing the need to constantly click on the screen. In this manner, you will feel as if you’re playing any other strategy game on PC, using your mouse and keyboard in tandem to obtain excellent results. We suggest taking a look at our guide on the BlueStacks Keymapping Tool before moving onto the next section. Once you’re acquainted with the tool, and know how to access and customize it, we can create an appropriate control scheme for this game, beginning with its combat. With the scheme configured like this, we can end our turn, use skills, finalize a unit’s movements, and activate the automatic combat mode, among many other things, using our keyboard. This screen is easier to configure. In our case, we assigned a shortcut to every function in the lower panel, which are the ones you will be frequently visiting throughout the game. In your case, however, you could remove some of the shortcuts from the features you use with less frequency. The only reason we decided to use a control scheme like this is to make it resemble that of a PC strategy game. Once you’re done, your control scheme should somewhat resemble the one we showed in the image above. Nevertheless, feel free to modify this setup to suit your personal preferences, and in the way you find most comfortable. In Langrisser, the Guild feature is useful for much more than simply meeting friends and establishing relationships with people across the world. After you join a guild in this game, you will be able to visit the Guild Dungeons, which are maps with unique challenges that can only be accessed with the approval of a Guild Leader, and only by people who belong to the said group. These maps present the opportunity to obtain great rewards as the players defeat the enemies within its recesses. They consist of battles in which the teams must fight against numerous waves of enemies, for a limited number of turns. Your success in these fights hinges upon the percentage of enemies you can defeat within the allotted time; the more you kill, the better the rewards. However, as we mentioned above, you can only access these dungeons if you belong to a guild. 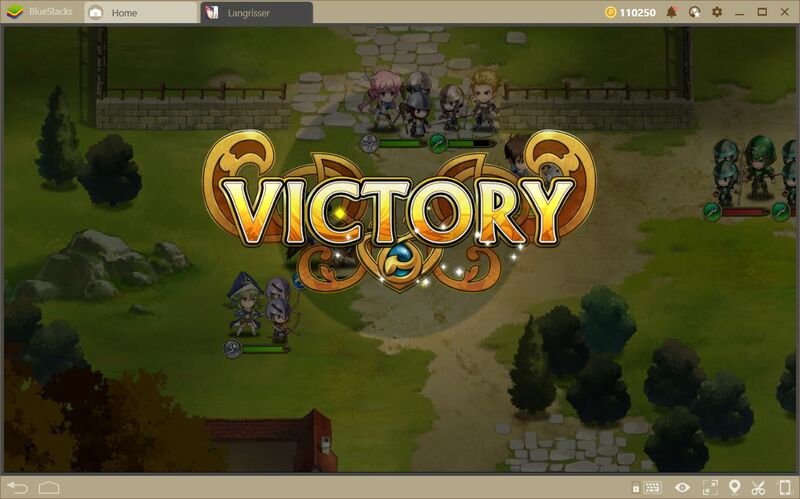 Luckily, the BlueStacks Instance Manager allows you to access the game using multiple accounts simultaneously, and to create a guild using these very same accounts. In this manner, you won’t have to rely on anyone to unlock these dungeons; you will have complete control over the content you wish to challenge and will be able to fight these battles singlehandedly using the teams in your multiple accounts. And better yet, the prizes you receive at the end of each dungeon will go straight to your coffers, and you won’t have to share it with your allies. 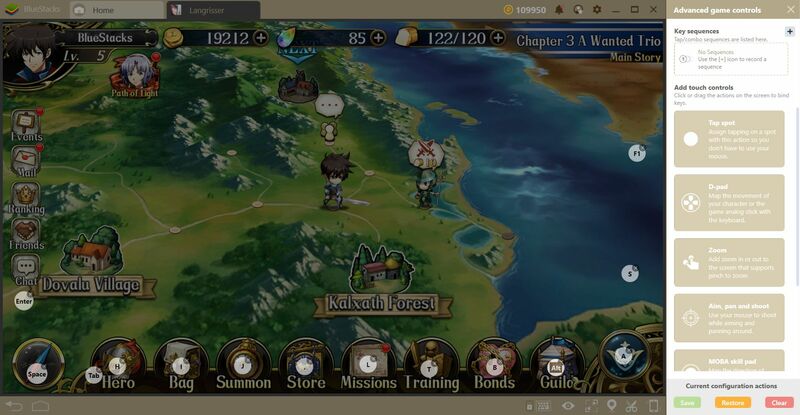 As we mentioned at the beginning of this article, BlueStacks offers several tools that can significantly improve your quality of life when playing Langrisser. The methods we have explained in this guide about the usage of the keymapping tool, as well as the instance manager, are only shown for reference purposes. In any of these cases, your creativity is the sole limiter for the things you can accomplish with these tools. How do you use the tools that BlueStacks provides? 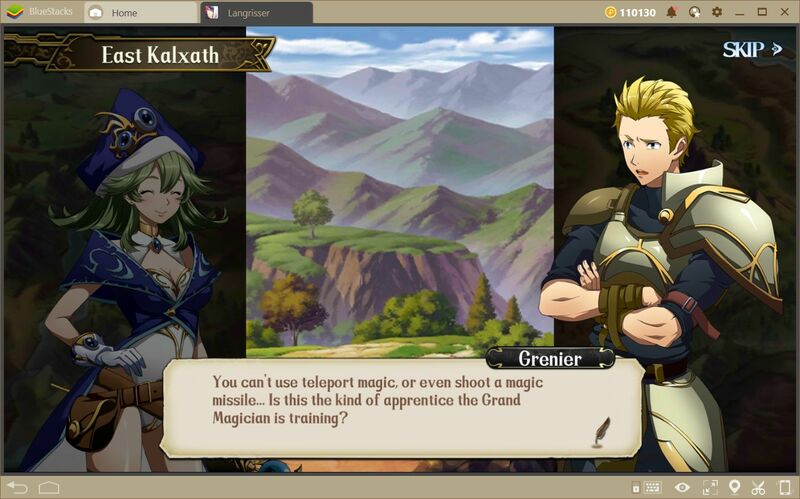 Share your favorite methods and techniques, and help your fellow players to improve their performance in Langrisser!